Bustards are large terrestrial birds that are found in dry open country and steppes in the Old World (includes Europe, Asia, and Africa). 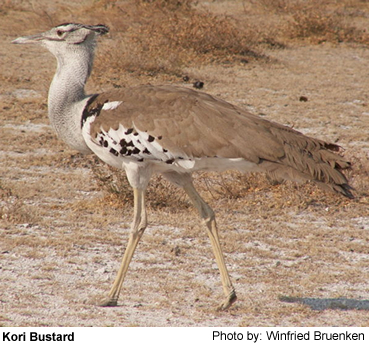 Bustards have strong legs and big toes. They have long broad wings with "fingered" wingtips. 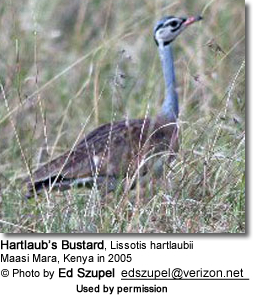 Bustards are omnivorous and nest on the ground. Lesser Florican (Sypheotides indica) is a large bird in the bustard family. It breeds in Pakistan, and is a rare summer visitor in Nepal. It has a very small, declining population, primarily a result of loss and degradation of its grassland habitat. In their breeding display, the male jumps into the air above the grass level.